WRIGHT THOMPSON, guest editor, started his sports writing career as a student at the University of Missouri, where he covered sports for the Columbia Missourian. He interned at the Times-Picayune in New Orleans and worked as the LSU beat writer. He then moved to the Kansas City Star, where he covered a wide variety of sports. In 2006 he joined ESPN.com and ESPN: The Magazine as a senior writer. He lives in Oxford, Mississippi. 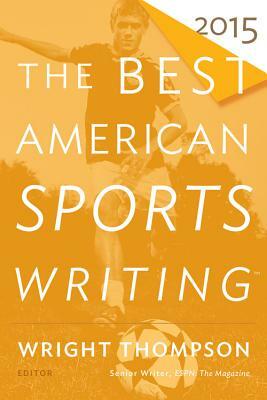 GLENN STOUT, series editor for The Best American Sports Writing since its inception, is the author of Young Woman and the Sea and Fenway 1912. He serves as the long-form editor for SB Nation and lives in Alburgh, Vermont. WRIGHT THOMPSON started his sportswriting career as a student at the University of Missouri, where he covered Missouri sports in a column for the School of Journalism's Columbia Missourian. He interned at the Times-Picayune in New Orleans and later worked as the LSU beat writer there. He then moved to the Kansas City Star, where he covered a wide variety of sports events including Super Bowls, Final Fours, the Masters, and the Kentucky Derby. In 2006, he joined ESPN.com and ESPN: The Magazine as a senior writer.